Mallam Ibrahim Omie, spokesman of the Peoples Democratic Party (PDP) in Kebbi State, says nobody was seriously injured when the podium collapsed during a campaign rally in the state a few days ago. 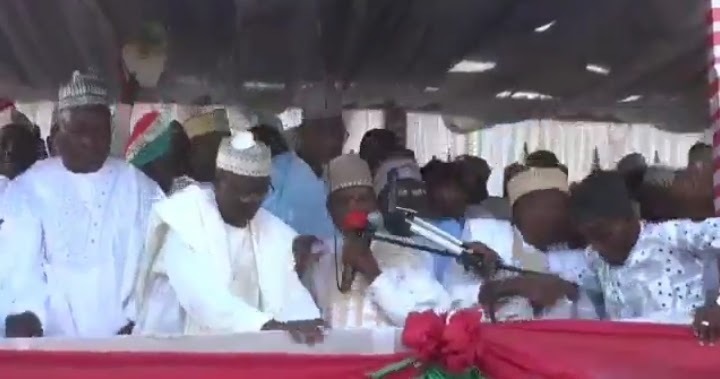 At the PDP governorship campaign rally held in Jega, Kebbi State, Alhaji Abubakar Malam, the party’s deputy governorship candidate, was making his speech surrounded by party leaders in the state, when the podium suddenly collapsed. Omie said those affected sustained minor injuries and has been treated in the hospital however, a video of the incident has gone viral on social media. Mallam Haruna B. Sa’idu, the Kebbi PDP state chairman, issued a statement on Tuesday noting that the party’s attention had been drawn to “a mischievous and dry video clip orchestrated by the drowning APC and its cohorts” on the incident. He stressed that what transpired was only an expression of the overwhelming support the PDP and its candidates, especially its governorship candidate, Senator Isah Galaudu Augie, enjoyed in the state.